Since I moved to Colorado several years ago, I’ve spent almost every winter weekend skiing at the well known resorts. However, at the end of last season I realized that I was missing out on the truly great part of the Colorado winter – the back country. This last weekend Dan, Phil, and I decided to do some back country exploring. We had originally planned on a winter attempt of Kit Carson, but after monitoring the avalanche report we decided to stick to something a bit closer to home. Saturday morning we meet up at the Brainard Lake winter trail head with our packs loaded. The temperature was about 20 degrees with a brisk wind blowing. We were prepared and headed off in search of a camp site for the weekend. A little way up the Mt. Audubon trail we found a sheltered camp site in some trees. Dan and Phil proceeded to setup the tent while I dug out a foundation for my BD MegaLite. 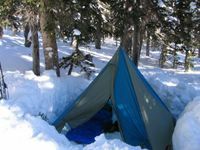 The MegaLite is really just a light weight tarp so I was a bit concerned about the amount of shelter it would provided in the winter conditions. I definitely wanted to make sure that it would stay up the whole night. After a good bit of digging, I hit ground about four feet down and was able to get some stakes in the frozen earth. I was counting on the combination of snow walls ant solid stakes to provide shelter throughout the night. After camp was setup, we headed over to Mitchell Lake to have a look around. The wind and snow constantly change the winter landscape so even with blowing snow in your face, it’s hard to turn back. There’s always a more spectacular view around the next corner. The sun was quickly setting however, and with our stomachs growling we headed back to camp for the evening. Over dinner and hot drinks we discussed our plans for the next day. We decided that if the winds died down we’d see how far up Audubon we could get. 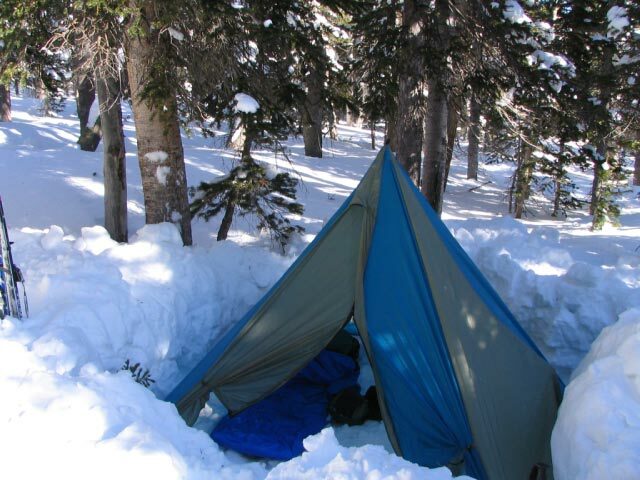 The next morning I was happy to wake up beneath a still solid shelter. However, the winds were still blowing and the weather didn’t look promising. Since we were so close, we headed up the trail anyway. About tree line, we were hit with blowing snow and intimidating clouds over the summit of Audubon. It wasn’t too hard to come to a consensus to limit our exploring to the relatively sheltered forest. We turned around, packed up camp, and made our way back to the cars.